Hello and welcome to another week of Outlander. This week it had to be so difficult not to name the episode something like “Woozy Doozy She Thinks She a Floozy” or something similar. It was truly an explosive week with a lot of emotions flying in many directions. Let’s dive right in shall we? I am one that watches the names in the opening credits on a first watch through just to see who we are going to meet or see again, and this week I did a smile of glee when I saw Nell Hudson and Bill Paterson both pop up. I knew we would see Nell this week, but I was really happy to see that Bill was going to be back reprising his role of Ned Gowan. The episode opens with Jamie (Sam Heughan), Claire (Caitriona Balfe), and Young Ian (John Bell) returning to Lallybroch, any happy reunion illusion is quickly squashed with Queen Icy Jenny (Laura Donnelly). Jenny is not having the return of Claire so suddenly, and she sure puts her claws into Jamie as well over the demise of the print shop. Not even Young Ian could break the tension, in fact, he only adds fuel to the fire by continuously opening his mouth and making Jenny even angrier than she already is. Even Ian Sr. (Steven Cree) has a few zingers, and that is not his usual style, so you know the Murrays are fuming. I was so happy I was able to focus on the actual characters and the work they were doing versus being distracted by Jamie’s hair. Thank you to the person that decided to cut it, I quickly got over Ian’s wig because it was the same thing just…whiter. The house is booming and full, and we meet more of Jenny and Ian’s children and grandchildren. This gives Jenny more opportunity to throw shade at Claire, with numerous snide comments from the fact she just lived there, to she would be a strange face confusing babies. I need to watch again and count how many times she says “That’s what happens when twenty years go by.” Jenny is not letting up and reminding me all over again how and why I didn’t care for her character in the book series. I love the interaction between Jenny and Jamie in the courtyard, allowing us to see some of that Fraser Fire that is always discussed as a characteristic. Jamie gives Jenny an outline of what happened to Claire in that she sailed for the colonies. She in returns tells him how she knows he isn’t saying the whole truth with a call back to “The Search” episode. When I see Jamie and Claire in the bedroom preparing for the night I always get a little happy, not because I think it will lead to them actually touching or a hug (I have almost given up on that hope), but because I feel it is usually the only place they actually communicate with each other. You never see them over a nice meal discussing stories like Duncan Kerr and the treasure left on the island by the White Witch. It is always deep conversations in the bedroom, pacing around. I enjoyed the use of flashbacks in this episode; I felt they lent to the story in a meaningful way and it is always nice to see what Jamie was up to while Claire was away. I do wonder did Sam Heughan swim in that thin clothing in cold Scottish water then run around wet on an island? They shoot in the winter and so if he did that had to be frigid. With the many whispers of needing to speak with Ned Gowan and mention by Jenny of Jamie’s other wife we can see he is getting ready to tell Claire what he has been keeping from her when BAM! in comes Laoghaire, the now grown girl that attempted to have Claire killed as a witch. She is a character that everyone loves to dislike. And she isn’t alone she has two girls both calling Jamie “Daddy” (even though they aren’t his biological children). I want to take a moment to say that Nell Hudson is astounding. She is such a happy, bubbly person in real life and for her to portray this vicious character to such a degree shows her amazing talent. I mean she is just flinging and spitting those words and herself. Great job Nell, great job. *Claps*. Anyone else find it interesting that little Joanie (Layla Burns) was the ONLY reasonable listening female of the house? She was so sweet. Back in the bedroom, Claire is trying to pack and get out as fast as she can, while Jamie is attempting to inform her of the how and whys. I do love a couple of lines in this whole interaction “You told me to be kind to her,” Jamie says. “I told you to thank her NOT MARRY HER!” Claire says in return. We are back at another echo of a favorite moment from season one, the fight by the river. Sam Heughan and Caitriona Balfe do some of their best work with each other when they are straight up screaming in each other’s faces. Jamie lands a low blow with blaming Claire for leaving…ouch… maybe this episode should have been named “Claire and the need for emotional Band-Aids.” In true Jamie and Claire fashion, this anger/fighting turns into passion but they are interrupted by Jenny and her water pitcher. Claire retreats downstairs, and Janet (Cora Tsang) blows the lid that Jenny is the one that sent for Laoghaire. See, I KNEW I didn’t like Jenny; she is like the worst mother-in-law and sister-in-law combination EVER. This time Claire attempts to tell Jenny of her travels to the colonies, Jenny is still not having it, and it is finally Ian Sr. that has to attempt to put Jenny in her place. The next morning the drama continues. 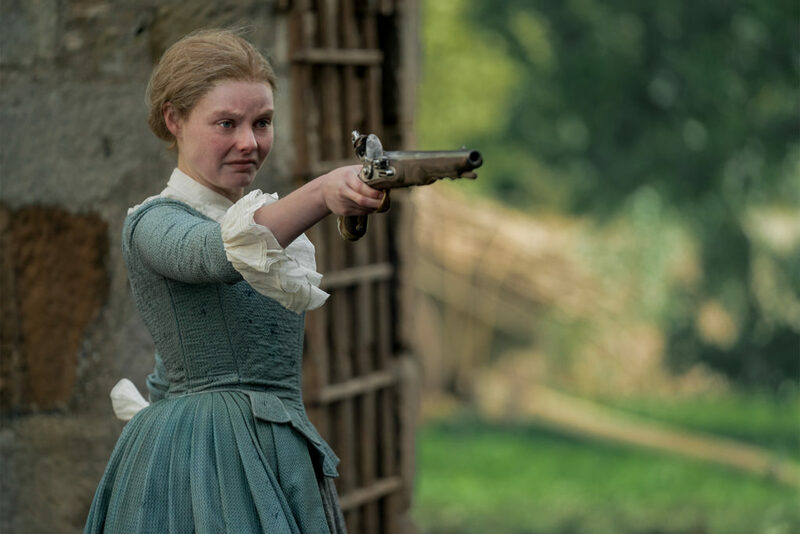 Claire is leaving, Jamie is doing a sad begging for her to stay, and Laoghaire comes back this times armed and fuming with that anger that is strumming through her body. Threatening to shoot Claire, Jamie steps between thinking that will stop her but she shoots him instead. Okay, when Claire is digging around for all of the shot is Jamie SLEEPING?! How much would he have to drink to be that out of it? I love Young Ian there, assisting, and comforting Auntie Claire. This was a scene that could have taken a wrong turn, but it was done just right. When Jamie awakes we get some GREAT season one-esque Jamie smolder, shirtless and bandaged by the fire. Ahhhh, how it has been missed. I do like how they are shadowing season one with the uncomfortableness of the beginning of Jamie and Claire’s relationship. It truly is an echo of the past and a reconnection. With Jamie’s story of how he became to be with Laoghaire, we get another flashback and find out it was all Jenny’s doing. This is the first meeting with Joanie and Marsali (Lauren Lyle), and both are amazingly cast. When Joanie asks Jamie if he would like figs, she had the gleeful look/smile like Nell had at the beginning of the series, and Lauren Lyle could be Nell’s sister they look so much alike, it is uncanny. I can’t wait to see more of her character especially since Marsali is my favorite character in all of the book series. The fun little addition of the penicillin shot was nice to have for the book readers and a moment that many would have been upset to see left out. I also liked hearing Young Ian mention the uniqueness/ specialness of Claire’s surgery instruments. Jenny makes a weak attempt at an apology, boo. Then there is Ned Gowan, bless his heart, he comes to Lallybroch to go over the legalities of both marriages and what it means now that Claire is back, and what Laoghaire’s demands are. It did take me a moment because I thought this all happened back to back and then I realized that some time had passed because Ned had been to speak with Laoghaire first. Laoghaire’s demands set up the rest of the story. To pay her what she wants, Jamie needs to remove the hidden treasure from the island, and Young Ian offers to swim out to obtain it for him. I caught the little “shout out” to Richmond with Claire wanting to send Laoghaire there. Jenny and Ian agree to allow Young Ian to travel with Jamie and Claire to obtain the treasure and then go to France with them to trade it in for the money needed to pay Laoghaire’s alimony. Jamie, Claire, and Young Ian head to the island and Jamie and Claire have meaningful interaction on the clifftop (versus a bedroom, yay!). As Jamie is giving a very swoon-worthy line about “being a printer does not compare to being your husband,” Claire sees a large ship quickly approach the island. Young Ian does not see the ship or those that row to the island, and there is no way for Jamie and Claire to reach Young Ian as he and the treasure are taken away on the ship, sailing into the horizon. What did you think of this week’s episode? What are you hoping for in upcoming episodes? This entry was posted in Bill Paterson, Caitriona Balfe, Conor McCarry, Episode Reviews/Recaps, Jennifer Getzinger, John Bell, Joy Blake, Laura Donnelly, Lauren Lyle, Nell Hudson, Production Photos, Sam Heughan, Steven Cree and tagged Bill Paterson, Caitriona Balfe, Conor McCarry, Cora Tsang, Episode Clips, Episode Reviews/Recaps, First Wife, Jennifer Getzinger, John Bell, Joy Blake, Laura Donnelly, Lauren Lyle, Layla Burns, Nell Hudson, Sam Heughan, Season Three, Steven Cree by Ashley Fendt. Bookmark the permalink.